Behold: The Pit of Ennui! I've fallen in there plenty of times myself. After crosshatching the backgrounds in every Corridor of Melancholy panel, I decided the Pit of Ennui could have a different background. I went with "solid white" because, hey, I'd already spent a few hours inking backgrounds, all right? Again, assume there is an eerie underground luminescence. 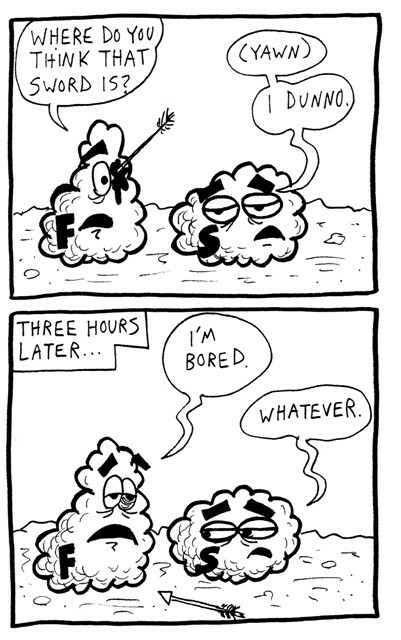 Also: I forgot to draw the arrow in Fuzzball's eye in the second panel. It was Mr. D.F. French who suggested showing it fallen out on the ground, so that then we would no longer have to remember to draw it. His rationale? "Hey, they're cartoon characters." I think it's a shame I had to resort to that, because I think it distracts from the point of them staying motionless for three hours, but at least we were able to put the arrow-in-the-eye behind us.